.Dr. Murphy completed externships in several different modes of practice. He studied at Capital Eye Consultants in Fairfax, VA. This was a referral center for some of the most challenging eye disease patients in the Washington, DC area. It was there that he gained an understanding of ocular disease and treatment under the tutelage of Dr. John C. Baldinger and Dr. James E. Powers. Here he participated in comprehensive eye examinations, emergency eye care, cataract evaluations, glaucoma consultations, and Lasik pre- and post-operative visits. Dr. Murphy completed an externship at the Veteran's Administration Newington-Medical Center in Newington, CT where he gained valuable experience in diagnosing eye disease pertaining to overall systemic health. He then joined a private practice in Easton, PA with Dr. John Boscia where he gained vast knowledge in primary care and fitting of all types of contact lenses. Finally, he did a Pediatric and Low Vision rotation at The Eye Institute in Philadelphia, PA.
Today, Dr. Murphy co-owns and operates his own practice, Clarence Eye Care, with his partner Dr. David Bartels. He performs comprehensive eye examinations, with special emphasis on eye health. Dr. Murphy diagnoses diabetic eye disease, glaucoma, cataracts and other ocular pathology. He also has a special interest in contact lenses, especially orthokeratology and keratoconus.Dr. Murphy fits a wide variety of lenses, and takes interest in “hard to fit” contacts. Dr. Murphy also continues to work for one of the busiest ophthalmology practices in Western New York, namely Fichte Endl and Elmer Eyecare. He has practiced here since graduating in spring of 2000. Here, he works closely with 4 ophthalmologists and 4 other optometrists in virtually every aspect of eye care including glaucoma and macular degeneration to Lasik and Raindrop technology. 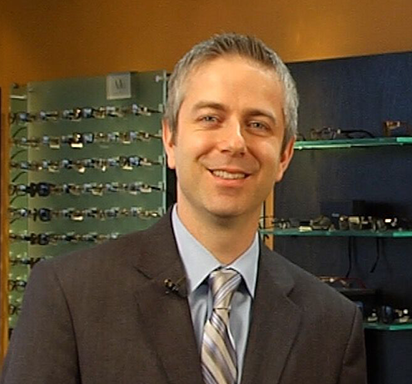 It has also been exciting for him to bring a unique device to the optometric community. Dr. Murphy co-invented the TigerChart in 2010. It is a digital near chart that enhances the the patient's experience when they are getting there eyes examined for their near vision prescription. As part of the large ophthalmology practice, he has also had the privilege to be a co-investigator in several clinical studies including Ocular Therapeutix, ISTA Pharmaceuticals and an Alcon Dry Eye study. He is currently an active member of the speaker alliance with Alcon giving talks to colleagues regarding the newest innovations in soft contact lens technology. In his spare moments, Dr. Murphy likes to spend quality time with his wife Jocelyn (also an optometrist) and their two children, Jacob and Alexandria. He also enjoys biking, volleyball, camping, and attending local sporting events. Dr. Murphy: As an optometrist and a dad, I believe it is vitally important to offer parents and children an alternative to their progressive myopia. Too often, the only option is a stronger prescription for new glasses or contact lenses. Progressive myopia is a problem of epidemic proportions that hardly anyone is talking about. As professionals (and parents), we need to offer parents and their children a solution to this ever growing concern. My wife and I were both nearsighted until Lasik. Our children were headed down that same path. As a parent, it was important to me to help them reduce that risk of progression. I know the challenges kids face cosmetically when they have thick glasses. As a doctor, I also understand the increased medical risks of retinal detachment and glaucoma with high myopia. My son has been corneal molding for almost 3 years and my daughter for over a year and they have both slowed down considerably with regard to their progression. For that, I am thankful. I feel that orthokeratology should be explained and made available as an option for every parent and child that trusts me with their eye care needs.